Accurate and judicious selection of piping support is critical to the success of a project. When we require pipe support wherein functional or construction details are different from the available details then a special support arrangement is required. Proper support selection should be the objective of all phases of design and construction. The use of spring hangers and can type supports is quite common in critical processes and power plant units. Lines operating at high temperature move upwards/downwards (depending on the pipe configuration) due to thermal expansion. Variable spring supports are useful in high temperature, high pressure conditions as they have a spring element that gets compressed or flexed when there is thermal movement of pipe and related loads. Rigid supports don’t work in such conditions and may cause breakdown. 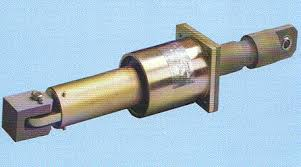 The spring hangers give continuous support when there is expansion or contraction of the pipe. Application: To minimize piping loads on nozzles, spring supports shall be used. Static restraints or rigid support prevent transmission of movement (caused by thermal or vibratory changes) on piping. 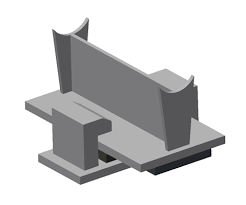 These rigid supports are vertical type provided from the top and designed to withstand tensile loads. That is no compression load can be exerted over it, otherwise it may cause buckling. 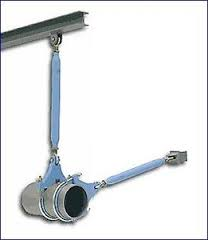 Rigid support consists of clamp, eye nut, tie rod, beam attachment. The selection of rod hanger depends on pipe size, load, temperature, insulation, assembly length etc. 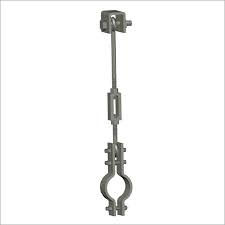 The arrangement is quite simple and it is very widely used in piping. As it comes with hinges and clamp, no substantial frictional force comes into play. Rod hangers offer support in the vertical direction and allows limited motion in the horizontal direction. Adjustment in the vertical direction is achieved by threads or a turnbuckle. Application: To transfer piping loads on vertical structure where space constraints for provision of pipe supports below, rigid/rod hanger supports shall be used. Rigid Struts are essentially used as compression and tension elements to reduce dynamic load. They can handle both tensile and compression loads – the struts can be provided in both vertical and horizontal direction. The selection depends on pipe size, load, temperature, insulation, assembly length. Rigid struts come with hinge and clamp, so no substantial frictional force comes into play. Rigid Struts are used in Pump, Turbine and Compressor connected lines near the nozzle connections to take the advantage of very less friction. Application:Struts can be used as a substitute for guide supports where structure is not available for using standard guides. Sway Braces are shock arrestors, that stop all movement caused by sudden loads in a pipe system. It is used to decrease pipe vibration amplitude, dampen the load and reduce overall movement. It stops the pipes from vibrating at their resonant frequency. Application: Sway braces are used for restraining vibration, arresting shock, leading, guiding or controlling the pipe movement resulting from thermal expansion. Snubbers are devices used to restrain pipe and equipment movement during abnormal dynamic conditions like turbine trips, safety/relief valve discharge, earthquakes etc. The snubber design allows free thermal movement of a component during normal operation conditions, but confines the component in abnormal conditions. Application: Snubbers are used to restrain the movement of pipe and equipment during abnormal dynamic conditions such as earthquakes, turbine trips, safety/relief valve discharge and rapid valve closure. 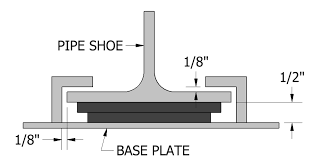 A slide plate is used to produce a low-coefficient of friction between stationary support elements and moving components to decrease the forces/friction that is caused by pipe deflections. Slide plates can be constructed using a variety of materials depending upon their use – including graphite, PTFE, 25% glass filled, stainless steel, and bronzphite. Application: To minimize piping loads on nozzles due to friction, sliding supports shall be used. They are applied variedly to provide piping support, especially in heavy equipment such as pressure vessels, and structural steel members. Special support arrangement are used innovatively in engineering design to provide pipe support and solve design problems that are unique to each construction. Clause 321.1.1 of ASME B 31.3 specifies the layout and design of piping and its supporting elements to prevent potential hazards and faults in design. As such, special support arrangement can be used creatively to solve design and construction challenges. Are you looking for the piping design engineering and piping support services for your plant? 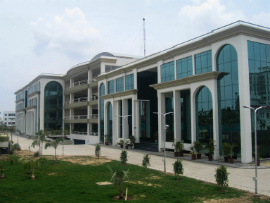 We have the excellent track record for the successful completion of most complex projects.